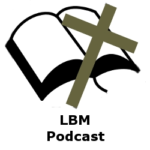 LBM Podcast 0022 – Do Christians, Jews and Muslims worship the same God? Jason first discusses recently joining Andrew Rappaport on his Google+ hangout, Jason then discusses whether Christians, Muslims and Jews worship the same God. We examine Surah in the Quran to see what Islam says about the God of the Bible. We look into what the Bible says about those who deny the deity of Christ. We look into the types and shadows of the Trinity in the Old Testament. In this episode Jason continues the series that discusses the Doctrines of Grace. We begin this episode with a discussion of the terrorist acts in France and the inability of the secular worldview to deal with this. We then go into a discussion of the the doctrine of the Perseverance of the Saints. This doctrine teaches that God will persevere all of his elect to the end. It teaches that the elect of God will continue in the faith till the end of their life because their faith is a gift from God and Christ is mediating and interceding for them. Do you know for certain the the Quaran is the inspired and authoritative Word of God? If you are a devoted Muslim, you most assuredly believe that Islam is the only true religion in the world and that the Quran is the written, true Word of Allah (God), which has been given to Muslims by Allah himself, through the prophet Muhammad. I am sure that you, as a true believer in Islam are fully trusting and believing in every word that is written in the Quran. If this is so, then according to a third chapter of the Quran, you must believe that the Bible (the Scriptures) is also the inspired Word of God.